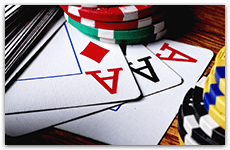 Chinese Poker has long been the choice for poker pros whiling away some time in the lobbies of hotels in-between levels at major poker tournaments. But there's a new kid on the block: Open Face Chinese Poker. If Chinese Poker is the crack cocaine of poker, then OFCP is the home-made, Breaking Bad, crystal meth of poker. 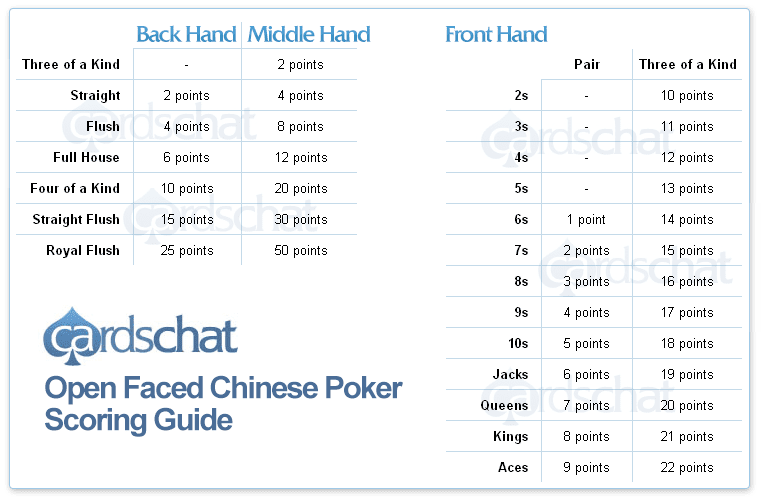 If you are familiar with standard Chinese Poker, you'll know the basics. 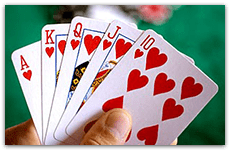 Players have to make three separate poker hands, two consisting of five cards and one of three, which rank from best (the 5-card 'Back' hand), to the next best - the 5-card Middle hand - to the worst, the 3-card Front hand. 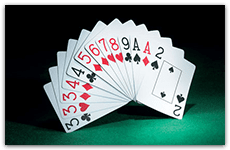 Ranking of each five-card poker hand works the same as in regular poker, so cards rank from lowest to highest: high card, one pair, two pair, three-of-a-kind, straight, flush, full house, straight flush and Royal Flush. The Front 3-card hand just has three rankings: high card, one pair, or three-of-a-kind (you can't have straights or flushes in your Front hand). Players then compare their three hands against one another (making sure that their own hands rank properly) and score points if they beat any of their opponent's corresponding Front, Middle and Back hand. In standard Chinese Poker, players are dealt all 13 cards at the same time and must make their hands in one go. However, OFCP works slightly differently. Open Face Chinese Poker can be played with up to four players and works with a Dealer button as in standard Texas Hold'em. Players get dealt one at a time from the dealer's left. Players in OFCP only receive five cards to begin with and must then arrange them face up on the table in order to start making their Front, Middle and Back hands. Once placed, these first five cards cannot be rearranged. Next, players receive one card face down at a time, until each player's remaining eight cards have been dealt out. Players take turns to place their remaining cards down and complete their three poker hands. There are two ways to win points in OFCP. Basic points are awarded just for beating your opponent's corresponding hand. For example, you win 1 point for beating your opponent’s corresponding hand (e.g. Middle Hand vs. Middle Hand), and a 3-point bonus if you sweep (win all three hands). There are also bonus "royalty" points for playing certain listed hands in the Front, Middle or Back hands. For example, you can win 25 points in the Back for a Royal Flush, (although 20 can sometimes be scored in some versions), 15 for a Straight Flush, (likewise, some forms of OFCP award 10 points), 10 for quads (again, 8 pts are awarded sometimes), 6 for a full house, 4 for a flush and 2 for a straight. If any of those hands are achieved in the middle, the royalties are doubled (remembering not to foul your hand). "Fouling your hand" is when your three hands end up being out of ascending order, that is the Front Hand is better than your Middle Hand, and your Middle better than the Back Hand, etc. Therefore, it's vital before you start scoring points that you don't foul. Points can also be won for hitting a pair of sixes or better in your Front Hand. One variation of the game has three-of-a-kind awarded 20 points (see Scoring chart). The key strategy in Open Face Chinese Poker is not to foul your hand. Remember, you won't get any points AT ALL for fouling, and you must still pay out all points to other valid hands. You can lose six points plus all royalties to an opponent if you foul, and that is why OFC is such an intriguing game: do you stay tight and concentrate on not fouling, or go for the big royalties and gamble? To stay on the right side of the foul, it is good to keep higher cards in your five-card back hand, lower ones in your middle hand, and the lowest cards in your three-card front hand. This rule can be altered slightly if you find you have a possible flush or straight among your first five cards. Going for a good straight or flush to earn your royalty in the back hand is the path to earning OFCP points. Open-face Chinese Poker is so much more than concentrating on just your own cards. You need to pay constant attention to the other players' hands too to work out your draws. There's no point hoping for a club flush when Players 2, 3 and 4 have most of the other clubs too, so you will need to rework your thinking on your best hands. Having advocated a straight, it's worth looking at the points table. You will see that a straight is only worth two points in the back and may not be worth chasing. When looking at up-cards, you need to be working out your outs (the cards remaining in the deck which can help you) and calculating the best odds for improving each hand. Essentially you are playing three poker hands at once, all of which are constantly drawing to better hands, PLUS you have to be careful not to negate them by fouling. Players sometimes neglect the front hand, dismissing it as just a 3-card pile of garbage. But to do that when you are looking for quick points is unwise. Remembering not to foul, placing a particularly strong front hand could be a good idea if you are confident if winning points from the other players. And with a lot of points up for grabs for front hand royalties, this could be a great strategy. Finally, because of the swings involved in Open-Face Chinese Poker, keep stakes small to begin with. Chinese Poker is a game of action and for sicko pros (or at least, it evolved that way) and should not be played if you are worried about getting heavily into the red to start with. If you are interested in trying out OFCP, check out some free play games online or invite friends over to try a few games for cents. Here is a typical OFCP hand, and how it would score in a game. Two players are in a hand of OFC. With a possible straight from their first five cards, Player 1 instead elects to keep their Front Hand weak and puts the A-2-3 in for high card. They spread their options by then putting the 4s into the Middle and the highest other card - the Jack - at the Back. Meanwhile, Player 2 opts for a big Front Hand with his pair of nines but has the stronger kings to fall back on in the Middle. He is risking fouling by having such a big Middle hand and is yet to place anything in the Back Hand. In the end, Player 2 got lucky and completed a flush in his Back Hand. He also picked up another King to make three of a kind in the Middle. Player 1, meanwhile, didn't foul but made trips in the Back with two pair in the Middle. Here's how the scoring pans out. Because neither player fouled, both are entitled to royalty points. Points for round: Player 2 wins 14 points. An alternate scoring system sees a straight 20 points awarded for three-of-a-kind in the Front hand. POFC is a very popular variant and is played by a maximum of three players. Here, you are dealt your initial five cards as normal, but then to make the rest of your 13 card hands you are dealt three cards at a time. Each round you keep two and discard the third face down. Discarded cards are not shuffled back in the deck, so take this opportunity to discard cards you know the other players need for their hands. Scoring and Fantasy Land are the same as for regular OFCP (and the extra cads make Fantasy Land a far more visited destination). However, in POFC Fantasy Land players receive 14 cards and get to keep 13 of them (discarding one). Given its hidden discard and potential for big hands, POFC is very popular. And if you want a brain ache it is also considered 400 trillion times more mathematically complex than regular OFC. A player's highest ranked hand made up of five cards. A standard form of Chinese where players make three hands simultaneously from 13 cards. A popular rule sometimes played in OFC where a pair of queens or higher in the Front hand is awarded bonus points. On the next hand, that player can have their 13 cards at the same time. An illegitimate hand where the Front, Middle or Back ranks in the wrong order. The lowest ranked hand, made up of three cards. A variant of Chinese where the lowest hands rank the best. 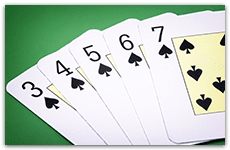 A player's second highest hand, consisting of five cards. A situation where all players score points from one another. A variant of OFCP which lets players take two cards at a time and discarding one following their initial five cards. Bonus points for scoring hands in certain positions (see Scoring chart). A 3-point bonus for winning all three hands. Having the same hand as your opponent. 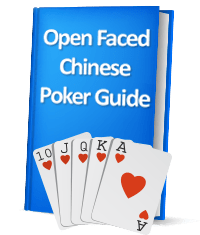 A popular live and online variant of Open-Face Chinese Poker with less time to act. Play OFCP at Loco Panda Casino now!